Full back tattoos are always a site to see. They are large and usually the person proudly sporting one has put a lot of thought into the concept before getting it inked. Full back tattoos get more ooohs and ahhhs than most other tattoos. It’s a huge commitment, obviously financially, but also because this is a large amount of prime real estate when it comes to the human body. You’d want to be sure to get something you’ll never regret. You’d have to search for and hire the right artist for such a big job. Getting a full back tattooed is time-consuming, involving multiple sessions of a few hours each. 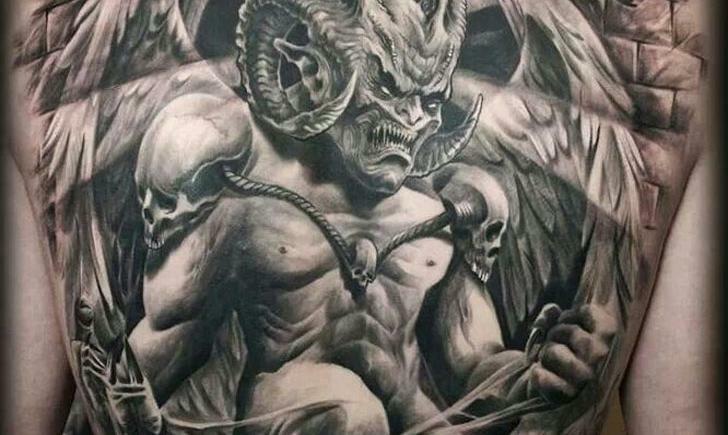 A good full back tattoo will be thousands of dollars, but for true tattoo enthusiasts, it is worth it! The back is the perfect part of the body to get someone’s dream tattoo. Some common themes are portraits, Asian themes such as koi, dragons, geishas or samurai. Wing tattoos can often take up a good portion of the back, which are most popular among women. We’ve all seen many pictures of beautiful angel wing tattoos, and they don’t get old! If the collector wants something more artistic and less “popular” or “common” he or she may even contact their favorite artist and get a true piece of fine art as their full back tattoo that no one else in the world will have. If you’re thinking about getting a full back tattoo, there are many things to consider. It’s probably ideal to have had experience getting smaller tattoos before you commit to getting your whole back done. It will be painful, it will be long, and it will be expensive. But to truly express yourself in such a bold, big way can be truly priceless. That’s what tattoo is all about, right? Tattoo is literal self-expression at its fullest in one of its truest and most beautiful forms. Do you have a back tattoo? Upload your pics to your profile! We want to see your amazing ink!